A sit-in over Seattle University's Matteo Ricci College curriculum — which some students say focuses too narrowly on Western ideas and history — has stretched into its seventh day. For seven days and counting, dozens of Seattle University students have been holding a sit-in in the lobby of a university administrative building, demanding an overhaul of one of the university’s elite programs and the resignation of a college dean. At issue, they say, is a classical curriculum that focuses on Western ideas and history, in part through the teachings of philosophers such as Plato and Aristotle. Students say Matteo Ricci College — a small, 194-student college that teaches the humanities — was sold to them as an elite, innovative program that promoted critical thinking and scholarship. Founded 41 years ago, the college is built on a humanities curriculum and offers three bachelor’s degrees: humanities, humanities for leadership and humanities for teaching. It has 194 undergraduate students and 20 professors. Jodi Kelly was named interim dean in 2011 and appointed permanently to the position in 2012. Instead, the students say, the college’s focus is too rigid and limiting, at a time when a broader understanding of the world is vital. At least in part, the university seems to acknowledge that the students have a point. In a letter to the university community this weekend, Seattle University President Stephen Sundborg said the students have raised serious issues, and that the university will address them. “I cannot pretend to know how deep their pain goes, the amount of harm it has caused or the extent of our own shortcomings as educators and administrators,” wrote Sundborg. Matteo Ricci’s dean, Jodi Kelly, has said she will do a comprehensive review of the college’s curricula, hire a consultant to assess the college’s culture and climate, and train faculty and staff in racial and cultural literacy. But students say there’s only one thing that will end the sit-in: Kelly’s resignation. That’s a demand Sundborg says he will not accept. An alumnus of the college has started circulating a petition on change.org in defense of Kelly. The protesting students say they’re prepared to spend the rest of the academic year — which ends June 10 — camped out in the Casey Building. Instead, they say, many Matteo Ricci courses are focused on close readings of the classics. And that’s not what the students were promised when they signed up. Kelly challenged that description. She said courses on the ancient and medieval worlds focus on classical texts, including works by Plato and Aristotle but also Confucius and Lao Tsu. The core of the curriculum, she said, includes studies on poverty, and students read African-American and Latino scholars, historians, playwrights and poets. Seattle University student Robert Gavino, who describes himself as Filipino and queer, said he fell in love with Matteo Ricci College and its method of teaching — at first. He was a star at the school, and was asked to speak during orientations and to help recruit for the college in area high schools. But Gavino feels he was held up as a kind of “golden child” of the program to discourage other students of color from disagreeing with the college’s approach. “They said, ‘Why can’t you be like Robert?’ ” said student Fiza Mohammad. 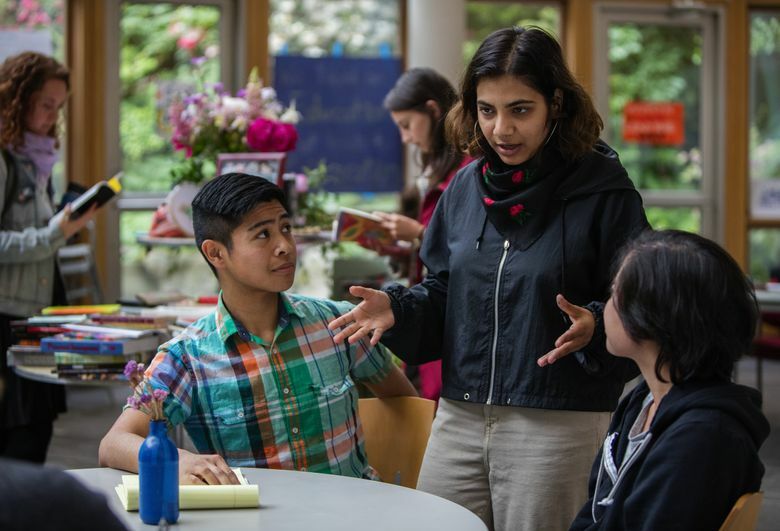 She is a fourth-year student from a working-class, immigrant family, who is at Seattle University as a Sullivan Scholar, a prestigious, full-ride scholarship program. In that way, she and Gavino say, the college administrators created doubt in their minds about whether their concerns about the breadth of the courses were legitimate. Gavino has since become disillusioned with Matteo Ricci. He is part of the sit-in. Last summer, Mohammad said, a small group of students met with Matteo Ricci alumni who recounted similar clashes with administrators. “The things they were saying were both heartbreaking and immensely validating,” she said. They say they have asked for changes during formal end-of-course evaluations, and also through informal meetings with administrators. Their focus is on forcing Kelly to resign because, they say, she has set the tone of the college and is responsible for its failings. Kelly describes it differently, saying the students gave her a list of demands April 26, and when she responded with initiatives that spoke directly to those demands, the students took over her office and asked for her resignation. “No other request other than the April 26 ‘demands’ have been put before me,” she wrote. To occupy the Casey Building, the students take shifts, with 15 to 20 of them occupying the rooms at any one time. They are still going to class, doing homework and assignments, but they spend the night sleeping on the floor of the administration offices — often staying up until 2 a.m., talking about everything that has happened during the day. They’ve held teach-ins and workshops, led rallies and marches through campus, and done media interviews. They say they’ve learned more about leadership in a week than they’ve learned in years of college education. They’re not the only students in Seattle — indeed, in the nation — demanding change from their universities. Last week, student demonstrators marched through the University of Washington campus, saying the university is not moving fast enough to address issues of diversity and equity. Similar demonstrations have taken place around the country. Students say their complaints are specific to Matteo Ricci College, and not to Seattle University as a whole. They say the university — which lists undergraduate enrollment as 4,712 in fall 2015 — offers a broad range of classes that address social-justice issues, gender differences, poverty and mass incarceration — but they’re just not learning about any of those things in Matteo Ricci. Matteo Ricci students don’t take the same core classes as Seattle University students do, meaning that it’s difficult to switch out of the college without losing credits, the students say. Late last week and early this week, as the standoff continued, the university received “vitriolic hate speech” in the form of phone calls directed at the student coalition, according to a message from Sundborg. The students staging the sit-in say some of their signs have been ripped down, and they’ve heard racial slurs shouted at them from outside the doorway. On Tuesday, Sundborg sent out a campuswide letter that decried students for calling Kelly “our racist dean,” and said such words run counter to the student code of conduct. Among their objections to Kelly, students have said the dean recommended a book to a student that had a racial slur as its title. He also said the university has taken steps to address concerns about the college not being diverse enough, including the formation of a task force on diversity in 2013. “We can and we will do better,” Sundborg wrote.